Important to our collection is the preservation of historical documents along with cat show memorabilia including trophies, medallions, awards and rosettes from the early cat fancy in the United States and England. Early 1900’s wooden cat carrier. Silver collar awarded to Cosey, the winner of the first Madison Square Garden cat show in New York City in 1895. 1880’s scrapbook of cat memorabilia compiled by Samuel C. Perkins of Philadelphia. Third prize rosette awarded to Daisy, a 3-color Manx, at the first annual cat show in Northampton, England in 1896. 1904 sterling silver chalice from the Sheffield Cat Show in England. Bronze of a Persian by J. Clayton Bright. 1846 hand block print by F. Silber. On display in the museum are many collectible objects d’art by prominent makers such as Lalique, Baccarat, Daum, Royal Doulton, Belleek and Lladro. 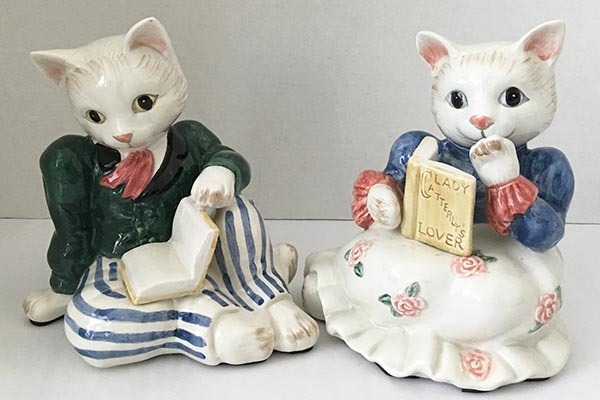 The collection also includes antique porcelain Staffordshire hand-painted cats, antique Steiff animals from Germany, and an incredible display of artwork. A number of trophies can be viewed, including a 1929 Washington Cat Fanciers award, a Fibber McGee and Molly trophy, and numerous medallions from early shows in England and the United States. The walls of the museum are covered in a variety of artwork in all mediums: photographs by well-known cat photographers, paintings by CFA judges such as George Summerville and Bob Bryan, prints of Yearbook covers by Govinder Nazran and Jamie Perry, intaglias by Mel & Jan Fleck, paintings and prints by a plethora of recognized artists, and an 1846 hand block print from Germany. A highlight of the artwork is a full-size photograph os the 100 Cats Scroll presented to CFA during their centeniall year. When trade cards lost favor as the method of advertising in the late 19th century, they were replaced with ads in magazines, many of which featured a cat in their illustrations. Several advertising pieces are on display, spanning a century of advertising. 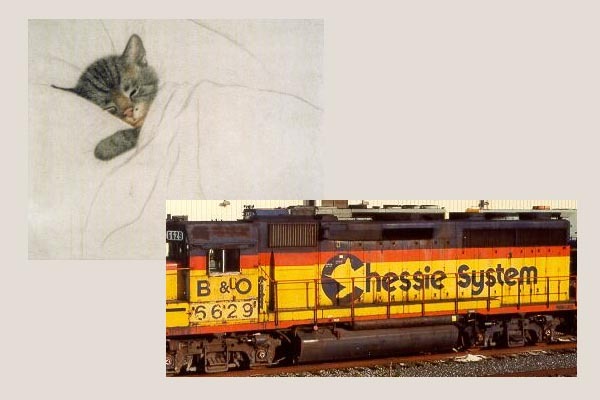 One railroad company used a cat illustration, “Chessie,” as its logo for many years and included it on a variety of items, many of which can be viewed at the museum. The museum is the home to a non-lending library where over 1,400 cat-related books provide reference for the general public and for researchers. The books are catalogued and are available for onsite review by interested parties. The library includes magazines, periodicals and other printed items ranging from general interest cat publications to newsletters specific to individual breeds. Foreign publications, veterinary journals and other pet-related titles complete the archive. The Feline Historical Museum is currently the home to a Maneki Neko Special Collection and a Cat Doll Collection, plus also has a Teapot Collection on display, as well as part of the Pat Ruzga Siamese Collection. Upcoming displays will feature the 50th Anniversary of CFA in Japan, the 100th anniversary of the Empire Cat Club, and a Manx breed display.